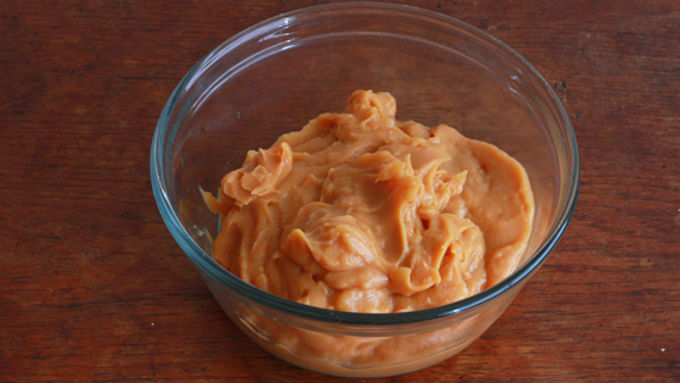 Drain the juice from the can of sweet potatoes and place the potato pieces in a blender. Puree until smooth. 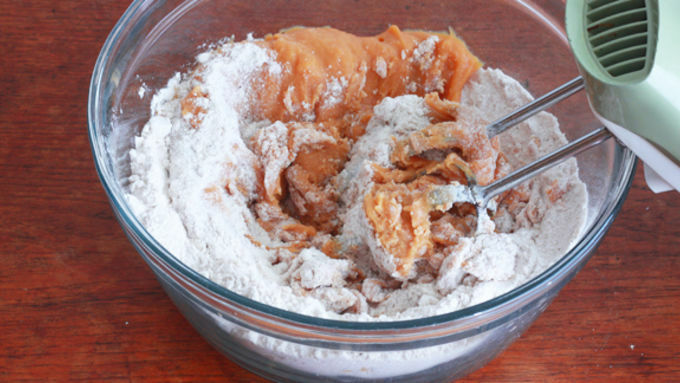 Pour the cake mix into a large mixing bowl and add the sweet potato puree. Blend with an electric mixer until combined. 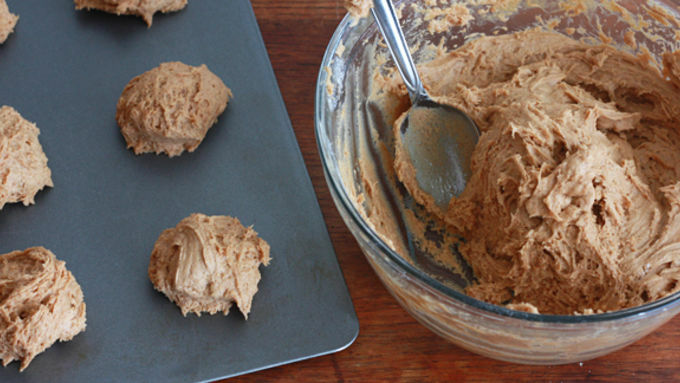 Drop by large rounded tablespoons onto a non-stick cookie sheet and bake for 12-15 minutes. Remove from the oven and allow cookies to cool completely. 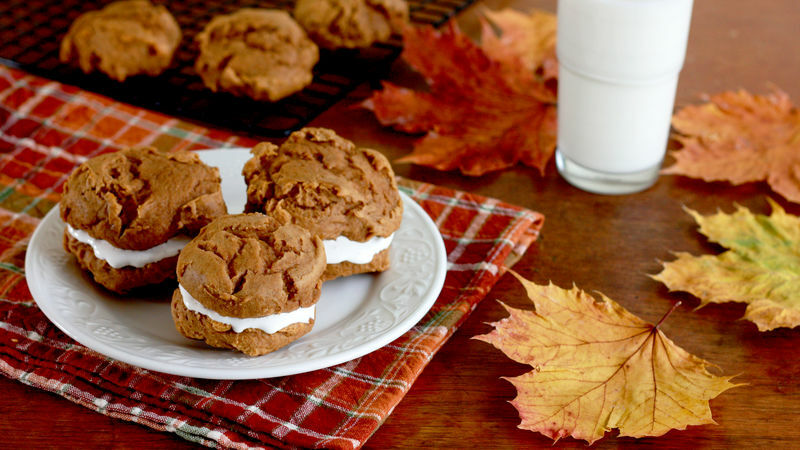 Spread some marshmallow fluff on the bottom side of one cookie and place another cookie on top to make a sandwich. Repeat with remaining cookies. Sometimes even a diehard cook-from-scratch fanatic who loves to live in the kitchen can appreciate the convenience of a quick meal, a quick dessert…a quick cookie. I know I do. And that appreciation has only increased with the addition of two little ones running in between and around my legs, somehow managing to mastermind all the baby locks on the kitchen cupboards and using the drawers as step ladders to reach the knives on the countertop while I frantically step away from a now splattering-everywhere-frying-pan to try and calm the chaos that has become my once haven of a kitchen! And then in the calm of the night, when I’m staring blankly at the walls, I wonder whatever happened to my former mastery of the English language that has metamorphosed into endless run-on sentences (see example above). *Sigh* So, did you notice the number in this recipe title? Three. Now, of course whoopie pies can get as fancy-schmancy and time-consuming as you want by including all kinds of ingredients, but three’s the magic number (didn’t you know?). At least it is today. And hey, the kids don’t know the difference. So for this version we’re sticking with three. That’s t.h.r.e.e. Drei. Tres. Trois. You got it. I don’t know about you, but my life could definitely use a little more simplifying. You, too? I thought so. And isn’t it nice and so…so…simplified when you can grab THREE ingredients from your kitchen cupboard and whip out these delightful marshmallow-centered whoopie pies in just minutes? Did I mention that these whoopie pies are super low in fat? Like virtually none? Yup, there’s no oil or butter. Nada. Zippo. Which means it’s okay to eat double the amount, right? Hey, whatever it takes to maintain sanity.